Health@Work (H@W) gave commuters a surprise at Moorfield’s station yesterday with the re-launch of their workplace alcohol campaign. 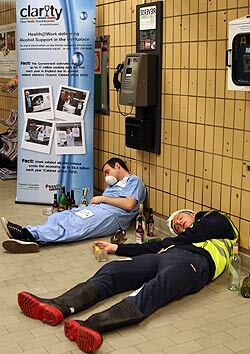 The charity employed two actors to pose as drunken workers at the station, to promote the Clarity campaign. Clarity aims to encourage sensible alcohol consumption amongst city workers and support employers to positively deal with workplace alcohol problems. He added: “In Liverpool we want to tackle this problem and communicate how damaging alcohol misuse is both to the well being of staff and the performance of the business. Whilst many will feel that such a message is part of the 'nanny state' agenda and a sign of the 'bah humbug' brigade trying to ban Christmas festivities, the reality of alcohol abuse and the cost to society in terms of ill health, early deaths and a burden on the NHS; has been highlighted this week in the publication of a new report by the North West Public Health Observatory at the Centre for Public Health. The new analysis by Liverpool John Moores University continues to show the rising toll alcohol abuse is having on health. The Local Alcohol Profiles for England record a 9% rise in hospital admissions for alcohol-related harm (an additional 174 admissions a day). Deaths from chronic liver disease are up by 7% and 5% in women and men, respectively. The only encouraging news was a reduction of 10% in road accident deaths attributable to alcohol since 2003 to 2,900. Liverpool, Halton and Wirral continue to feature in areas highlighted as worst affected by alcohol harm. The TUC has been calling for the development of workplace alcohol policies as far back as 2003. The TUC's 2003 report, "Drink and work - a potent cocktail", states that people are drinking more now than ever before, but few employers have alcohol policies in place to tackle any problems. According to the TUC report, alcohol is a major factor behind absences from work with up to 14.8 million working days lost as a result of drinking every year. It is also estimated that longterm sickness, unemployment and premature death due to alcohol abuse costs the UK economy some £2.3 billion a year. The TUC believes that not enough is understood about the effects of drink on the workplace, and it is calling on the government to fund more research into the growing problem. It also points to such workplace factors as stress, bullying and long hours, working away from home and the office culture which can all lead to individual workers consuming more alcohol than is good for them. Unions are concerned that many employers are turning to companies which offer screening and random testing as a means of dealing with alcohol and the workplace. The TUC believes that these are never effective at keeping drink away from work, and they raise a number of privacy and human rights concerns. "Drink is definitely a workplace issue. People who like the odd drink or two may think their drinking is under control, but their colleagues who have to cover for their 'duvet days' and long lunches might think otherwise. 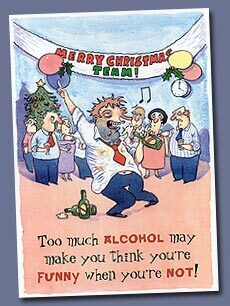 Drinkers are also risking serious damage to their health. It’s in everyone’s interest that we tackle the UK’s growing drink problem." Last month saw the release of the findings of the Big Drink Debate which looked at the nations drinking habits and involved over 30,000 people filling in both on-line and posted questionaires around alcohol use. The biggest ever survey on alcohol in the North West revealed that low price and discounts are fuelling our unhealthy drinking culture. Of the 30,000 respondents, 80% said that they thought low price and discounts increased people’s drinking. This revealing statistic is taken from The Big Drink Debate carried out earlier in the year in a bid to understand why the region has one of the biggest alcohol problems in the country. The results also revealed that 75% of respondents believe that large measures are key to increased drinking; that 68% of respondents say allowing street drinking increases alcohol use and over half of respondents believe advertising (56%) and extended drinking hours (54%) are factors that increase drinking. More than a quarter of respondents drink at harmful and hazardous levels, which suggests that more than a million people drink at this level across the North West, and that nearly half the respondents avoid town centres because of the drunken behaviour of others. 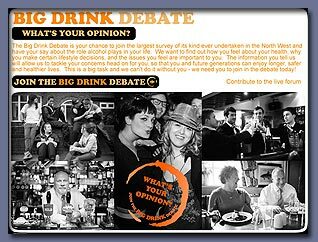 Launched by Our Life in partnership with Government Office North West and The Department of Health, the aim of The Big Drink Debate was to find out what people’s views are on drinking and how it affects their health, safety and well being. Professor Bellis, Director of the North West Public Health Observatory, which analysed the results, said: "There is no such thing as a free drink. The real price the North West is paying for ’buy two get one free‘ and other cheap booze promotions is poorer health, more violence and, town and city centres seen by many as no-go areas at night. “In the Big Drink Debate, four out of five people identified cheap alcohol and discounts as driving increasing alcohol consumption. Many people already understand the dangers that such increased drinking represents. The challenge now is convincing drinkers that consuming less and paying more is likely to improve their health and the prospects of the North West as a whole."